Mosquito Madness came about around the time I was first teaching Sunday School to 7th and 8th graders. I had boys who had little interest in what I was talking about. One of the boys, D, however, was a great basketball player for his age. I heard about a United Methodist Initiative that was trying to fight malaria through a project called Nothing But Nets. (The Methodist eventually created a separate project called Imagine No Malaria.) I decided that would be a project we could do for the summer that would keep them focused and somewhat entertained. We organized a 24 hour basketball marathon where the participants collected pledges. D had an uncle who pledged to pay a $100 for every consecutive free throw D could make. He made 12 that night. I learned more about malaria but more important how kids that age could make a difference. Becca Williams is living the life of the average, sometimes bored, fifth grader in Iowa City. She has some friends and some enemies, a strict grandmother, and an aunt on a big adventure in Africa. More than once, Becca gets in trouble at school and with her grandmother. Becca's boring life becomes more exciting when she and her grandmother get a mysterious postcard from Aunt Abby asking for nets. They learn how the tiny mosquito spreads malaria and Becca becomes motivated to to help prevent the spread of this deadly disease as well as find a cure. Becca and her friends learn how people working together can help make a change in the world. Proceeds from this chapter book for young readers will support Nothing but Nets and Imagine No Malaria. 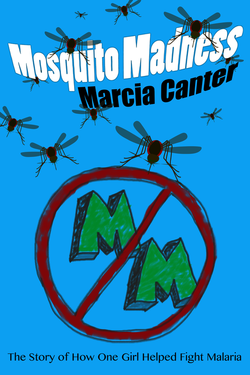 You can purchase the paperback version of Mosquito Madness through Lulu Publishing as well as e-book version. ​Purchase of these books helps improve the world. A percentage of each sale will go to causes that make a difference. So then can you. Mosquito Madness supports organizations fighting childhood illness in Africa. This month it supports Imagine No Malaria. and Nothing But Nets. Postcards From Me supports organizations helping families with children battling serious illness. This month it supports Cystic Fibrosis Foundation. Every Woman's Tale supports women in crisis. This month it supports The Family Tree. A Different Kind of Christmas and Other Stories supports veterans and their families. This month it supports Project Sanctuary.